What is the Michigan Health Alert Network (MIHAN)? Who can register for a MIHAN account? How many roles can users have? Which organizations should I select when registering? What type of information will I need to provide to register with this System? The MIHAN is a secure web-based information sharing and all hazards notification system. The MIHAN is meant to alert multiple individuals/groups/organizations simultaneously of conditions that could adversely impact the health and safety of Michigan’s citizens. The system is also used for collaboration on emergency planning and provides notifications for situational awareness about important but non-emergency health-related information. The State of Michigan administers MIHAN to facilitate information sharing between federal, state, local Public Health Departments, clinics, hospitals, and other public health emergency partners on a 24/7/365 basis. This common environment brings together dissimilar organizations and allows them to take a uniform approach during health response and recovery. To be eligible for an account on the MIHAN system, an applicant must be considered a key point of contact during an emergency. The registration process involves selecting a matching functional role along with the organization where you physically work. Once registration is complete, it will be reviewed by a MIHAN Administrator to determine whether an account is appropriate. Upon approval, you will receive an automated message from the system indicating you are accepted into the requested organization. Alert information provided through the MIHAN is suitable only for health and safety professionals. The MIHAN is not intended for use by the general public and media organizations. MIHAN participants are limited to three roles. When registering, participants select the role(s) that best matches their job function in emergency response. Roles are representative of a user’s broad job function. Select only the organization you work for. Users should only select one organization. Open the organization tree folders to find your specific organization. For example, a person that works in a hospital in Ingham County would open the “Hospitals” folder, then “Region 1 Hospitals”, then “Ingham County Hospitals” to find the listing for their organization. There are three user levels on the MIHAN system: User, Messaging and Admin. Basic users are referred to as Recipients and can only receive alerts. Those that wish to send alerts but don’t need to manage users can be upgraded to the Messaging level and granted the Recipient Manager right. MIHAN Coordinators are given the Admin level so they can manage the users in their organization and the Recipient Manager setting so they can send alerts to all Recipients on the system. When registering, you must provide work contact information, job title, and preferred methods of contact. You must also agree to the terms of service. Only include direct phone numbers on your profile. Do not use phone numbers that connect to a switchboard or front desk. It is recommended that you enter a username that consists of your first initial, last name, and additional numbers if your username is already taken. Alerts are sent based searches for the roles, organizations, and geographic locations assigned to the user. Alerts will be sent according to the methods of contact you selected in your profile and may include phone, fax, Short Message Service (SMS)/Text Messages and pagers. The majority of MIHAN alerts will be sent to your email address. Yes, security is a top priority on the MIHAN and includes encrypted data storage and transfer. Region 1 is comprised of Clinton, Eaton, Gratiot, Hillsdale, Ingham, Jackson, Lenawee, Livingston, and Shiawassee Counties. Region 2 North is comprised of Oakland, Macomb, and St. Clair Counties. 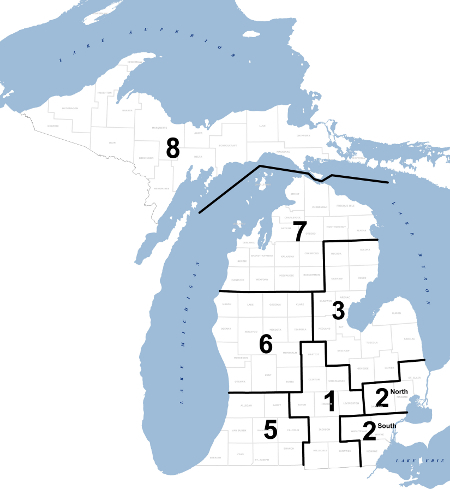 Region 2 South is comprised of Detroit and Monroe, Washtenaw, and Wayne Counties. Region 3 is comprised of Saginaw, Alcona, Iosco, Ogemaw, Arenac, Gladwin, Midland, Bay, Genesee, Tuscola, Lapeer, Sanilac, and Huron Counties. Region 5 is comprised of Allegan, Barry, Calhoun, Branch, St. Joseph, Cass, Berrien, Van Buren, and Kalamazoo Counties. Region 6 is comprised of Clare, Ionia, Isabella, Kent, Lake, Mason, Mecosta, Montcalm, Muskegon, Newaygo, Oceana, Osceola, and Ottawa Counties. Region 7 is comprised of Manistee, Wexford, Missaukee, Roscommon, Benzie, Leelanau, Grand Traverse, Kalkaska, Crawford, Oscoda, Antrim, Otsego, Montmorency, Alpena, Presque Isle, Cheboygan, Emmet, and Charlevoix Counties. Region 8 is comprised of Chippewa, Mackinac, Luce, Schoolcraft, Delta, Alger, Marquette, Dickinson, Menominee, Baraga, Iron, Gogebic, Ontonagon, Houghton, and Keweenaw Counties.